A Fair Trade: The Story of the Jade Treasure ~ Chinese Short Story for Kids No Reviews Posted. LET'S GO TO CHINA, OVER TWO THOUSAND YEARS AGO. That a time called the "Period of the Warring States." Seven kings from seven different states warred fiercely with each other, each one hungry to take the power and land from his neighbor. From time to time, the states grew tired of war. In such times they sent messengers to negotiate treaties of peace. Such times of peace always felt uneasy for the people. For they knew war could break out at any time. The weakest of the seven states was Han, and the strongest of the seven was Chu. One day a court official who served at the smallest of the seven states, the Kingdom of Han, purchased a beautiful piece of jade from a stranger. When the court official took it to a jade expert to have it appraised, the expert said, "This is no ordinary piece of jade that you brought to me. This is none other than the legendary Jade Treasure! Do you see its marvelous color? There's no piece of jade in all the carved vases, bowls, or ornaments of any palace of any king that compares to this stone. And the Jade Treasure has other virtues, too. It can shine in the dark. It can keep a room warm in winter and cool in summer. It even repels insects. You must always guard this - indeed, this is a magnificent, priceless treasure!" News travels fast. The King of Han heard of the wonderful Jade Treasure that had been obtained by one of his court officials, and sent word that he wanted to see it. The court official was worried when he heard this. Surely the King of Han would find a way to take it away from him. Perhaps he should escape with the jade treasure before the day he was supposed to go see the King? "That would not be wise, sir," said one of his houseguests, a young man named Gan. "The King will surely hunt you down. You will lose the stone and your life, too. Instead, I suggest you offer the Jade Treasure to the King outright, as a gift." So the court official offered the King of Han the wonderful Jade Treasure. The King was delighted with the magnificent stone and promoted the court official to be chamberlain of the royal court. Soon the King of Chu, whose land was the strongest of the seven states, heard that the King of Han had in his possession the legendary Jade Treasure. "I cannot believe this!" cried the King of Chu. "We are the strongest state - we should have this matchless stone for our own! Send a message at once to the King of Han that he must sell it to me and that I will pay 15 cities for it." "Fifteen cities?" said one of his mandarins in surprise. "That is quite a lot - a generous price to pay!" "Not at all," smiled the King of Chu, stroking his beard. "The envoy from Han will bring us the jade. Once we have it, who will remember if we ever said anything about 15 cities? And if we don't deliver the 15 cities after we have the jade, what can Han do about it, anyway?" "Ah, yes!" said the mandarin. He hastened to do the king's bidding. Now when the King of Han received the message from the King of Chu with the demand that he must sell the stone for the price 15 cities, he was worried. Certainly fifteen cities was a good price. But what if the King of Chu simply kept the precious stone and didn't deliver the cities as promised? What choice would that leave the King of Han? If he protested that the King of Chu had broken his word, that could easily be an excuse for the King of Chu to invade the Kingdom of Han, and that's a war that his kingdom could not win against the mighty Chu. On the other hand, was he to just hand over his wonderful new national treasure? As he was debating the pros and cons of the troubling situation, his newly promoted chamberlain said, "Sir, my houseguest Gan has proved in the past to be wise beyond his years. Allow me to summon him and let's hear his advice." "My glorious King," answered Gan, "the stone must be surrendered for the good of your subjects. Otherwise the King of Chu will invade us and destroy us. Yet we need not despair. Let me be your envoy. Entrust the Jade Treasure to my care. May my life be forfeited if I do not return the jewel to you, if the King of Chu refuses to keep his word." So Gan's journey would have the best luck possible, the entire court fasted for three days, as was the custom in those times to launch a journey with the most favorable prospects. At the end, they hosted a grand feast to as a send-off to his journey to the kingdom of Chu. The young man Gan, with great reverence, wrapped the Jade Treasure in an embroidered silk covering, tucked it inside an even richer silk pouch, and placed the silk pouch in a pocket inside his robe. Accompanied by a noble train of attendants, he set out on his journey. When he arrived at the kingdom of Chu, the King welcomed him and his entourage. They were entertained and feasted with all honor. When the time came for Gan to present the Jade Treasure to the King of Chu, the young man approached the throne, took out the richly embroidered silk covering, unwrapped the priceless Jade Treasure and offered it to the King of Chu to examine. The stone gleaned and shone with mesmerizing radiance. After admiring the Jade Treasure, the King of Chu passed it onto his officials who immediately congratulated him for securing such a priceless gem. The King of Chu ordered his servant to take the Jade Treasure to his other court attendants and show it to them. Gan waited for a long time. He waited and waited. But the Jade Treasure was not returned to the king's table. No mention had been made of the 15 cities. Seeing that the King of Chu had mentioned nothing about the 15 cities, Gan said, "Sire, there is a flaw in the Jade Treasure. Please allow me to show it to you." The King of Chu quickly ordered his servant to bring the jade back to Gan. Once the stone was safely in Gan's hands, he took several steps backward until he was next to a pillar. "We came in good faith," he said, "because you offered Han fifteen cities. My king fasted for three days and set me off with a grand ceremony to take the Jade Treasure to you. If you are acting in good faith, you, too, will fast for three days and arrange a grand ceremony for me to hand over this Jade Treasure to you before all your court. If not, I will smash this pillar with the stone right now. I will be destroyed, so will you, and so will the Jade Treasure!" The King rushed forward, "What is this rash talk? Of course we were planning a ceremony just as the one you describe. We were already planning to fast for three days, then to have the ceremony." 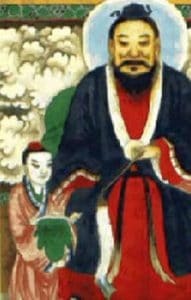 Each morning for the next three days, the King of Chu sent a servant to check that Gan still held the Jade Treasure. In the meantime, Gan sent one of his attendants in disguise to see what was really going on in the palace. He found out that there was no fast at all, but a mad scrambling to make preparations for the hastily arranged ceremony. On the morning of the event, after the servant of the King of Chu had checked to see that Gan still had the Jade Treasure, Gan sent his most trusted servant back home with the stone. At the event, when it came time for Gan to hand over the wonderful Jade Treasure, he said, "O King, surely you must understand our hesitation when we came in good faith with the wonderful Jade Treasure and you did not even talk about the 15 cities as promised. Your state is strong; ours is weak. I had no choice but to send my attendant back to Han with the Jade Treasure. No doubt he is already halfway back home." All gasped. "This is an outrage!" cried the King of Chu, jumping up. "We fasted for three days and planned this ceremony just as you said. Now you tell us you are not keeping your side of the bargain!" "Kill me if you wish," said Gan. "My life is in your hands. Only know that I am the only one who knows the route my attendant has taken and can direct you to him if you choose. If you want to bring with you the deeds to the 15 cities I will accompany you to my attendant now. He will give you the Jade Treasure and you can deliver the deeds to the cities at the same time. If this is not agreeable to you, pour me into a cauldron of boiling oil if you wish. Let the other states decide who was right and who was wrong when they hear you have executed the messenger from the smallest kingdom of Han." The King of Chu knew that killing Gan could inflame the other states to team up and make to war against him. Though his state was no doubt the strongest of the seven and would surely defeat the small kingdom of Han in battle, if several other states were to joined in a combined effort against him, who could tell what the result would be? Besides, he didn't have the 15 deeds of the cities ready because, as he had never intended to deliver them, they had never been prepared. Thinking quickly, the King of Chu laughed. He said, "Ah, you must know that I planned this entire affair as a test to see how your state would react. I had no intention of killing you, of course, or even ending up with that silly piece of jade. I wanted only to see the quality of how your kingdom of Han handles negotiations. You have performed honorably, congratulations! Stay for our banquet - we have a fine feast prepared in any event - and return in peace to your homeland tomorrow." The royal court thought the King of Chu very clever for staging this test on Han, not realizing that the king had been caught short and had thought of the test on the spot. But that was not as clever as the King of Han thought of Gan, when his attendant returned safely with the Jade Treasure and when, days later, Gan returned safely as well. The King of Han quickly promoted Gan to the rank of highest court official, where he served with distinction for the rest of his days. The King of Han never received the 15 cities that were promised by the King of Chu. And so of course the King of Chu never received the magnificent Jade Treasure. I liked the story very much. Very interesting. "The Most Wonderful Jade Treasure" from Wonder Tales from China Seas by Frances Jenkins Olcott (Longmans, Green & Col, Toronto, 1925), pp.131-135. "The Wonderful Jade Treasure" from The Ch'lin-lin Purse: A Collection of Ancient Chinese Sories, retold by Linda Fang (Farrar, Straus, Giroux, New York, 1995), pp. 101-113. The Period of the Warring States ran from about 475-221 BCE. It was a time of violence and chaos during which the philosopher Sun-Tzu lived. Six states engaged in more or less constant warfare with each other and a seventh, Yen, remained mostly out of the fray. In 223-221 the ruler of Tsin, Cheng Wang, succeeded in conquering his rivals and established a unified Chinese empire. The basis of his success were the introduction of cavalry into Chinese warfare and the replacement of bronze weapons by iron ones. The state was centralized. Cheng Wang became known as the Book Burner because of an early decree to burn books. He is also credited with constructing the Great Wall of China. In China there is an expression "The entire jade returns to Chao" that comes from this story and is often used to promise that a borrowed item will be returned in its original condition.